Power amplifiers aren’t the most exciting components in the world. They normally don’t have many bells and whistles on their faceplates and thus don’t command as much attention. Most people probably place their power amp on a bottom shelf with good ventilation and, aside from switching it on, pretty much forget about it. Which is a shame, because, personally, I think power amps are beautiful little beasts. Many entry-level listeners want the convenience of their preamps and power amps in a single chassis. Which is fair and understandable. It’s less expensive that way and, let’s be real, there are plenty of great integrateds out there. This is all old stuff at this point, and basically part of the audiophile gospel, but it’s worth repeating. There’s a real argument that separate components sound better for a number of reasons, the primary one being that manufacturers can allocate more attention and budget to each section when they’re separate. This inflates the cost of a system, of course, and means jamming more equipment into an already packed living room. Personally, I love stuff, and can’t have too many shiny metal boxes [Wait till you get to my age, buddy—JV], but I understand that most people will choose convenience over incremental upgrades. Regardless, if you want the best sound for your system, separates are a great way to go. The $299 A-150 stereo power amplifier is a part of Emotiva’s BasX line, which, as the name suggests, is a collection of basic components sold at really good prices. I can’t say I’m a huge fan of the capital “X,” which harkens back to 90s-era cyberpunk, but I am an enormous lover of affordable, quality sound, so Emotiva gets a pass. On top of this, I can’t say that I find the A-150 particularly beautiful, which shouldn’t be a shock. I get the distinct impression that Emotiva is more interested in manufacturing great-sounding components than making great-looking ones. The A-150 delivers 75Wpc into 8 ohms and 150Wpc into 4 ohms—respectable numbers and plenty of power for most people. 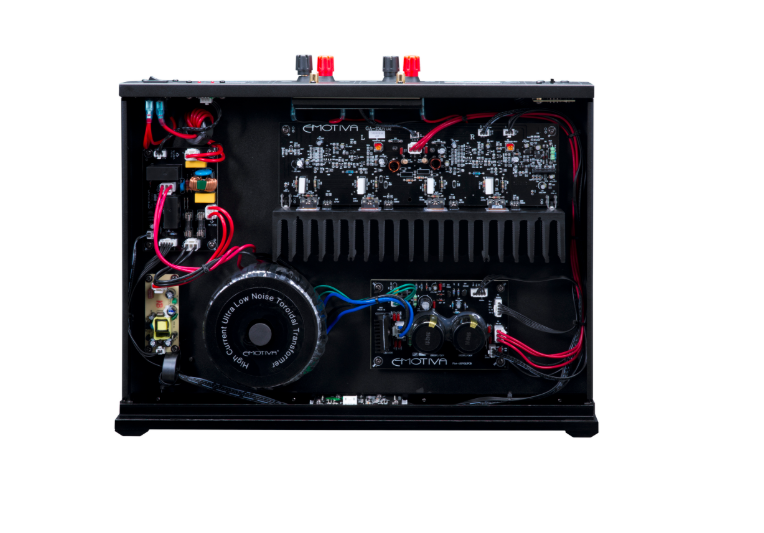 The amp is rather compact at only 17" wide and 3 1/8" high, and weighs a relatively light 15.5 pounds. The front panel has two blue LEDs, one for each channel, and the power button glows blue when the amp is active and amber orange when it’s on standby. I like the minimalism here, with only two bumped-out corners as decoration, and the Emotiva logo, the product line, and the component name on the faceplate. Not beautiful, but serviceable. Setup was a breeze. I used my Cambridge Audio CXA80 as the preamp, so all I had to do was swap the speaker cables and run some RCAs. The A-150 uses a two-prong power cable, which means that your fancy upgraded three-prong cable won’t work with this unit. Not the end of the world, since there are nice two-prong cables available, but worth noting. I haven’t tumbled down the rabbit hole of power cables just yet, but I won’t pretend that I can resist the siren song forever. Anyway, the binding posts are normal five-ways, not fancy by any means, but effective. There’s a power switch on the back that puts the amp into standby mode where it’ll stay when not in use, and a button on the front to get it up and running. The A-150 is a Class AB design, which is surprising, considering how cool it runs. It was almost cold to the touch, and even after listening to music for at least six hours straight, it barely broke a sweat. I didn’t feel a single bit of heat coming from the chassis in all the time I used it, which probably means it would be happy tucked away on the bottom shelf of an entertainment center. It was also surprisingly quiet, which is important to me. I have a tiny little listening room, so excessively noisy equipment is a big distraction. No problem there, though. Heat and noise are always considerations with an amp, and the A-150 is solid on both fronts. My initial listening impressions were mixed. The bass felt bloated; the top end maybe had a hint of grain; but the mids were smooth. Overall it was a nice, relaxed sound. As time passed though, the A-150 developed a pleasant sleekness. That top-end grain disappeared, and the bass tightened up. I never felt totally satisfied with the low end, but it definitely improved. There were moments where I thought it was almost veiled or just a little too loose, although that never overwhelmed the music.